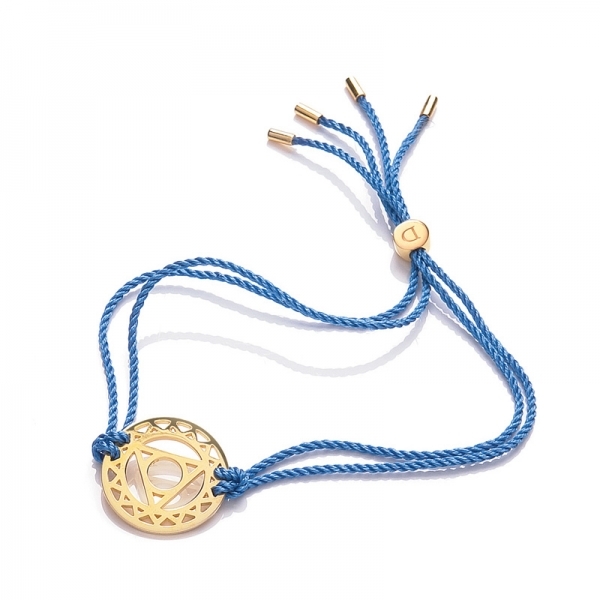 New from Daisy the 24k Gold Gloss Blue Throat Chakra Bracelet. Known as VISHUDDHA, the Throat Chakra is a symbol of communication, resonance and creativity. 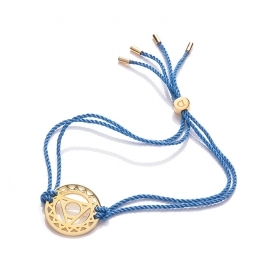 Featuring an adjustable blue silk thread, this best-selling chakra bracelet makes a beautiful gift. The Chakra measures 2cm in diameter. The best-selling Daisy Chakra Bracelets have fast become a celebrity phenomenon; internationally recognised and forever on the arms of A-Listers Sienna Miller, Katy Perry and Kanye West to name a few.These Chakra Bracalets are both chic and cool! Easy to wear, go with everything pieces that equally suit both men and women. Each Chakra Bracelet comes beautifully packaged in its own pouch with explanatory leaflet.